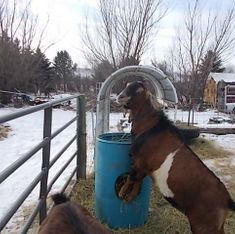 We have very limited space for housing our goats in the winter, so the first three breeding seasons we made arrangements to use bucks from a friend. In September, 2014, we took the plunge and brought home two bucks from the herd of Endine Karges. These represent new bloodlines for our herd and have strong milking and showing records behind them. We're excited about the influence they'll have on our herd. Here you can see how well Paco (left) and Atlas get along together. They're watching the does walk past. As usual, Atlas is talking. Grandmother of Atlas - Pruitville's N/E Razzberry. The handsome fella above is Pruitville's Starbuck - sire of Atlas. HIDDEN MEADOWS CRYSTAL MAJESTY - aka "Paco"
"Paco" has traveled a great deal in his life. 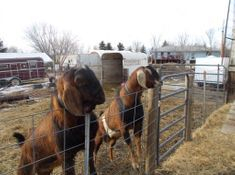 Born in Oregon, he lived in Texas with Jean Baugh for a bit, then came to North Dakota when our friend Endine Karges expanded her herd with a group of Jean's goats. That's when he acquired the nickname of Paco. He's big and strong but has a lovely attitude and presence. 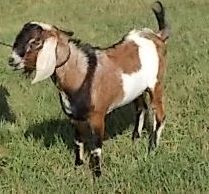 One of his kids (Popcorn) came north from Texas and her mother Cherry. 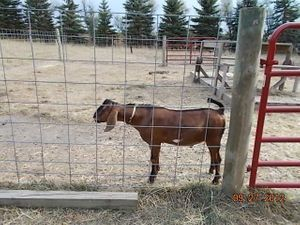 Popcorn now has a kid of her own in another North Dakota herd and Paco kids are popping up around North Dakota. 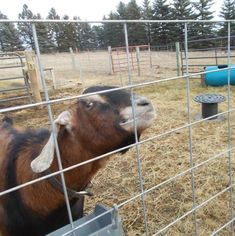 Paco has kids across North Dakota. You can see his daughters from Mony in the 2015 Kids section. We've repeated that breeding for 2016, as well as putting him in with Star and Shekel. In 2017 he was visiting a friend's herd, so is only bred to Shekel. In 2018, he was bred to Shekel, Divy and Dance. in 2018 he was bred to Cherry, Dance and Divy. 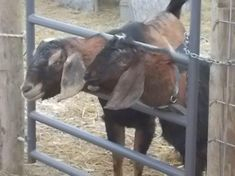 Paco's standing by the gate to the doe corral; flirting with Mony. You can see he'd like some privacy. Photo taken in September, 2013. Atlas comes from strong milking lines and gives that strong, long stature and fabulous type. He provides boning and lovely, sharp withers. The Linear Appraiser called him an "outstanding" young buck, despite the fact he would only stand coupled up and ready to mount. Atlas was a bonus kid bred in Texas just prior to his dam's purchase and trip to North Dakota. He and his triplet brothers came out large and ready to impress. I took one look and fell in love, but at the time - didn't think I'd be keeping bucks on the place. I love his wide stance, size and head. His kids have those long, elegant ears. When he and Paco joined the herd in September, 2013, Atlas was all shaggy and ready for another North Dakota winter. That's fine by me. He gets along great in the cold. It's hard to get a photo of Atlas where he isn't showing off all his masculine glory. In 2015 he produced eight kids from three does: one buckling and seven beautiful doelings. Their heads and ears are simply stunning. He produces long, straight kids with plenty of strength and boning. 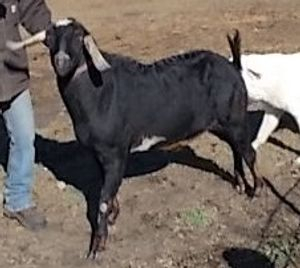 His first daughter that I freshened (Shekel) at 13 months of age kidded easily with twins and is easy to milk with higher production than her dam. His 2016 kids crop (2016 Kids) was another nice group. We've bred Atlas to most of the herd for 2017. 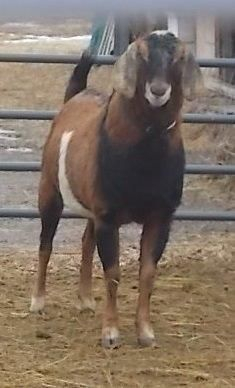 In 2018 he was bred to Cherry, Millie, and Dimples. We're delighted with the kids he's produced who have large, strong structures and willingness to milk. His buck kids tend to be mini-Atlas. We were pleased to have two Atlas sons go through linear appraisal this year and score well. The bucks below don't live here, but have influenced our herd. Dandy is a dandy boy! Look at that profile and his ears. He's got a wide stance, great depth of body, and just plain exudes strength. With a sire like Lakeshore Farms Doctor Luke, this guy has a lot to live up to - but he's off to a great start. His kids come out with a definite Dandy look. Born in Connecticut, he worked as a herd sire in Texas, then came to North Dakota in the fall of 2013. This photo was taken as he stepped out of the trailer. Though Charlie is no longer on this earth, his daughters and their progeny are producing thousands of pounds of luscious milk in herds throughout this region with wonderful udders, great strength and beautiful temperments. His sons reflect Charlie's stature and strength with a quiet gentleness that is great to have in the barn. When we first purchased foundation does Money and Izzy, I could see how they complemented each other. It became a goal of mine to someday breed one's does to the other's buck. 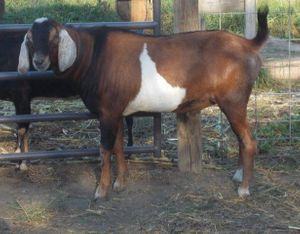 In order to realize my goal - I decided to keep a 2012 buckling from Izzy to breed to the 2011 does from Money. 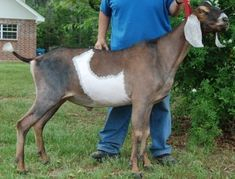 I bred those young ladies a couple of months earlier than I normally would, so I could then sell Raj and let him work in another herd. Seeing the results - I'm glad I made that choice - especially since Izzy died after the breeding. 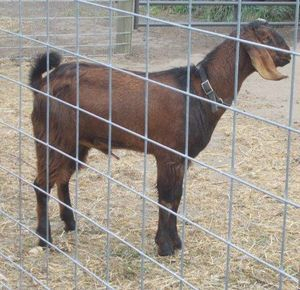 Raj's babies keep Izzy's genetics alive in my herd.